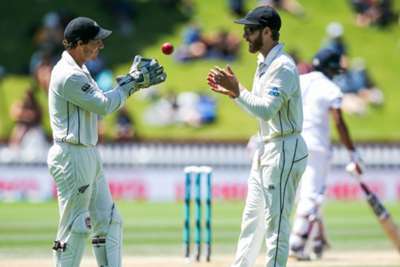 Kane Williamson said New Zealand tried everything to attempt to force a victory over Sri Lanka after they were denied by Kusal Mendis, Angelo Mathews and rain in the first Test at Basin Reserve. Only 13 overs were bowled on the final day due to the weather, with Mendis (141 not out) and Mathews (120no) taking their unbroken fourth-wicket stand to 274. The Sri Lanka duo batted all day on Tuesday to frustrate a Black Caps side that looked to be heading for an emphatic win when they reduced the tourists to 13-3, only for Mendis and Mathews to come to the rescue. Williamson said New Zealand ran out of ideas after Sri Lanka moved on to 287-3 before the rain brought the match to a premature end. Rain wins day five after a fighting effort from Mendis and Mathews. We now head to Hagley Oval in Christchurch for a Test series decider! Asked what he might have done differently, the New Zealand captain quipped: "Maybe everything. "I don't know. Everything we did didn't provide too many opportunities. We sat down and had a number of conversations with other senior players and said 'what's something else we can try?' We tried pretty much all of it. "Very rarely do you go a whole day where there's not an opportunity – regardless of what you try. That's a credit to the way the two Sri Lankan batsmen played, to deny us for the whole day." "Nothing was carrying through to the keeper. We tried a number of short deliveries which we'd like to think might have brought about something foreign in terms of strokeplay, but it was very difficult. "It's tough when there isn't some assistance. Not that you expect a lot, but whether it's turn or some variable bounce - you can apply some pressure in a way. It did flatten out a lot and made life fairly difficult."